It feels like forever since I last wrote a piece for The Football History Boys, but this summer we are back! Over the last two and a half years, one period of time has fascinated me more than any other - the Victorian Era. It was in this time that we saw the growth of the British Empire, the changing of social order and of course the beginnings of codified sport. In this piece we are going to dive straight into this 'sporting revolution 'and learn how football was played, perceived and pondered by people rich and poor. More specifically we are going to see how it impacted Wales. The last few years has seen a rise in the popularity of the game in the country, due mainly to the success of the national team and the growth of genuine superstars really starting to rival their rugby counterparts. So how did the game come to Wales? And how did it compare to its oval-shaped rival? Football's codification in 1863 launched what is now colloquially known as the sporting revolution - a period of time which saw the beginnings of the most sports we know and love today. Football's simplicity and relative ease saw it capture the spirit of both the working and upper classes. Played originally by public schools and amateur clubs the sport grew to include all areas of society and eventually the 'disease' of professionalism, as players began to be paid to play - something not quite in keeping with polite English society. But of course we are talking about Welsh society, something still to this day seen as very different to that across the border. 150 years ago Wales was a nation based almost entirely on one thing - coal. Coal-mining communities were the most prominent areas of the country and it was from these that many 'new' sports began to develop and grow. Rugby was the major game of choice for many as a chance to maintain a physicality needed for the mines and a chance to show off a new form of national identity when against their British counterparts. "Although the Welsh language, music and religious nonconformity have also played their part, few other cultural forms are as well equipped as sport to express national identity. Its emotions, national colours, emblems, songs and contests all make it a perfect vehicle through which collective ideas of nationhood can be expressed." So where does football fit into this 'national identity'? It is worth noting that Wales does in fact boast the third oldest international football side in history (after England and Scotland). Their first international? A 4-0 defeat to Scotland. However, it is not with the national team where we are most to be concerned, it is at the grassroots level where we can really see the affect football had in the country. It is clear from newspaper research that the game was not as popular as it could have been in the 1870s. The Western Mail took great pleasure in calling attention to a new competition "with a view to increasing the popularity of the game in Wales". What is difficult to differentiate is newspaper articles with concern to "football". In the 1870s football was ambiguous - it could mean both the association game (soccer) and its rugby alternative (rugger). Any research requires a great deal of extra work to see just what the journalists are talking about! Further letters and correspondence can be found by fans of football at a local level. One, again in The Western Mail, asked for the opportunity to set up a Cardiff football team it believed could "hold its own against any club in South Wales or the West of England." Despite no direct mentioning of identity, it is clear that people were interested in playing against sides across the border at club level to show what their city could do. Spectatorship was also seen to rise towards the end of the nineteenth-century and by 1877 Wales had its alternative to the FA Cup - The Welsh Cup. The final match to decide to whom the honor of being the first custodians of the above cup should belong, took place on Saturday last, at Acton Park, Wrexhain, and resulted in a victory for the Wrexham team, who ob- tained one goal to none. Great interest was manifested in the match and notwithstanding the threat of a snow- storm nearly two thousand spectators assembled to witness it. "The very large crowd lining the ropes augured well for tha future popularity of the "Soccer" code in South Wales. In spite of the unpropitious weather—it could not have been more unfavourable—the attendance must have numbered at least 1,500, and their appreciation of the finer points of the game demonstrated the fact that they were all "Soccer" enthusiasts. And here let a word of commendation be offered to the committee of the Aberdare Club on the appearance of their new ground. With the exception of the enclosures of the big Rugby clubs, such as Cardiff, Newport, and Swansea, it is one 'of the best appointed football grounds in Wales." Maybe it is unwise to compare football with its more aggressive counterpart - rugby but we are going to have a look anyway. It was in Victorian Britain that rugby was established as the nation's 'pastime'. A north/south divide was evident throughout Britain with regards to both football and rugby, based on the question of 'professionalism'. Rugby went as far to split in to distinct factions of the game - League and Union. Welsh players opted for the Union 'amateur' route as an opportunity to display their national identity and really compete with their English neighbours. Rugby Union offered much in terms of Welsh representation but it was something football had already seen for fifteen years. Wales of course were founding members of British Home Championships in 1884. The Montgomery Express is fairly clear in what it believes to be the 'national sport' but was it accurate for Wales? So what of the national team's results? Opinions on localised football are difficult to find, but the national team can offer a barometer as to the sports' popularity. It is no surprise to see that Wales was behind both the English and Scottish in the game's infancy. Both nations had already been playing internationally for four years with clubs from England and Scotland competing in the FA Cup. Following numerous defeats to both - Wales eventually recorded back-to-back victories over in 1881-82. A 1-0 win in Blackburn was followed by a 5-3 triumph at the Racecourse, Wrexham. 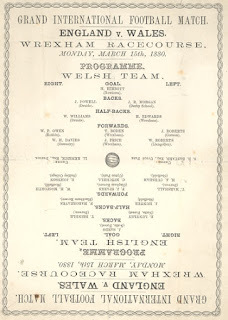 "On Monday afternoon this international match was played off on the Wrexham Racecourse and resulted contrary to the anticipations of many, in a victory for the Welsh Association by five goals to three. The weather was everything that could be desired, but. if anything the players would have had no objection to its being a little colder. There was a large concourse of spectators, it being estimated that there were upwards of 3000 persons on the ground. Of the previous matches England has won two one played at Wrexham, and the other at London. The third match, played at Blackburn, was won by Wales, so that the victory they obtained on Monday equalised matters." 3000 spectators in 2015 may not seem that many, but it represented a large step in the popularity of the game. By 1900 in the same fixture the Towyn-on-Sea and Merioneth County Times recorded over 5000 supporters at the game. The jump is not too noticeable, but the location is - Cardiff Arms Park. It was the first international played in the future capital, in what was then a rugby stronghold. Superstar Billy Meredith scored the equaliser as Wales drew 1-1. 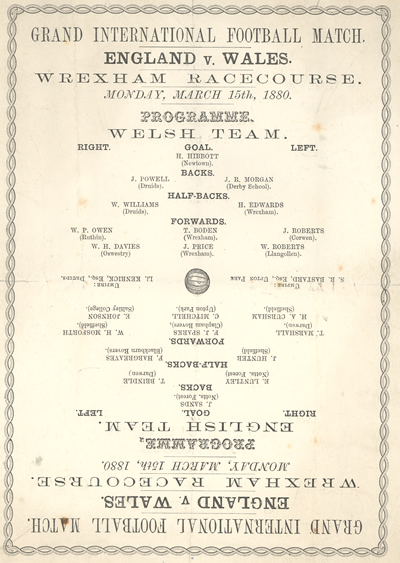 In the years before the First World War the international matches played by the Welsh alternated between Wrexham and Cardiff, showing a growing popularity all over the nation. Wales eventually even managed three consecutive wins over Scotland between 1905-07 - winning the Home Internationals for the first time in 1907. So there we have it - a brief history of football in Victorian Wales. Where we have seen in England and Scotland the sport capture the spirit of the general population, Wales provides something different, almost an immunity to the flow of the sporting revolution. Its cousins across the border highlight a game steeped in class and north/south division whereas in Wales we see something of an uneven development, especially in the south. Despite Rugby being and remaining the nation's pastime, football has never been too far behind. From 1876 the sport has been played at an international level, with eras like the 1950s, 2003 and the present day showing us that football has been able to become a source of national pride and identity - it is not the national pastime but no doubt one which we can be proud of.